The risks involved in introducing new drugs and devices are amongst the most discussed issues of modern medicine. Presenting a new way of thinking about these issues, this volume considers risk and medical innovation from a social historical perspective, and studies specific cases of medical innovation, including X-rays, the pill and Thalidomide, in their respective contexts. International cases are examined through the lens of a particular set of shared questions - highlighting differences, similarities, continuities and changes, and offering a historical sociology of risk. Particularly important is the re-conceptualization of dangers in terms of risk - a numerical and probabilistic approach allowing for seemingly objective and value-neutral decisions. 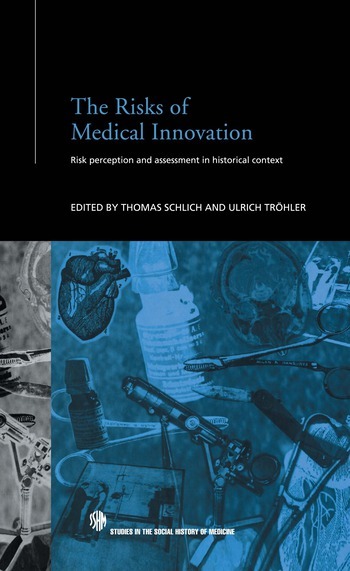 Read together, these papers add to our understanding of the current debate about risk and safety by providing a comparative background to the discussion, as well as a set of generally applicable criteria for analyzing and evaluating the contemporary issues surrounding medical innovation. Thomas Schlich is Canada Research Chair in the History of Medicine at the Department of Social Studies of Medicine at McGill University, Canada. Ulrich Tröhler heads the Institute for the History of Medicine of the University of Freiburg, Germany.